What is a High Security Registration Plate? As the name suggests, a High Security Registration Plate (HSRP) is a highly secure number plate aimed to bring about a uniform pattern of displaying registration marks across the country. HSRP plates are made of aluminium featuring unique details apart from the registration number. The plates have a seven-digit unique laser code, chromium-based chakra hologram to prevent counterfeiting, a self destructive sticker with the engine and chassis numbers of the vehicle, ‘IND’ inscribed in blue colour, with India inscribed at a 45 degree angle in hot stamping foil across all letters and numbers on the plate. Last but not the least, it has a non removable and non reusable snap lock. Why is there a need to shift to HSRPs? Fitting vehicles with HSRPs has been under consideration since 1989. But the implementation process has gained traction only now after the Supreme Court cracked the whip on state governments over repeated delays. The regular registration plates can be easily tampered with, making car thefts easy. Fancy number plates also make it difficult to track down lawbreakers on the run. HSRPs are tamper-proof and non-replaceable, which could prove to be a deterrent to car thieves. It will also aid in creating a computerised, national data of motor vehicles – which currently is not the case as the records are created and maintained manually. I stay in a remote village in Manipur. Do I still need to get an HSRP? HSRPs need to be fitted on to each and every vehicle in the country irrespective of where you live. However, the manner of implementation will be a phased one. In fact, Manipur is among the first states asked to introduce the scheme by the Supreme Court along with Delhi and Kerala. In Delhi, the programme was kicked off on May 1. Existing vehicle owners will have to switch to the new plates from June 15. A set of HSRP plates for four-wheelers cost Rs. 334 and for two-wheelers Rs. 111. Commercial vehicle owners need to shell out Rs. 134 while Heavy Commercial Vehicles are required to pay Rs. 258 (including taxes). The plates also come with a minimum guarantee of five years. How do I get one? How long will it take? If you’re buying a new vehicle then you needn’t bother much as all new vehicles sold in the country will come fitted with HSRPs. The registration number of the vehicle will be put on the front and rear windshield of the vehicle as well. Existing vehicles will be given a time span of two years to switch to HSRP from June 15. To get an HSRP installed in your vehicle, owners would have to visit the local RTO, where the new plate will be issued within 48 hours upon showing the smart registration cards. Fitting the plates in itself is just a 5 minute job. There are also talks of streamlining the process by taking it online. What is the snap lock all about? The snap lock will hold the number plate in place on the vehicle. Any attempt to remove or replace the snap lock will cause the lock to break which makes it impossible to install any other number plate on the vehicle. In case the bumper and/or HSRP is damaged in an accident the replacement can be provided only by the RTO. What good is the laser code? Will the police have a device to check the laser code? The unique seven-digit laser code is the biggest safety feature. 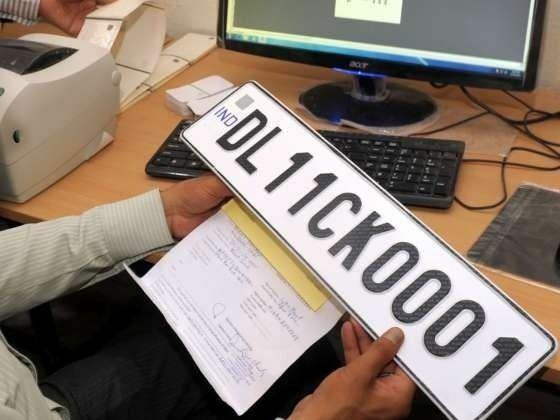 It is meant to be scanned by laser detector cameras to identify if the number plate details match the laser code and whether or not the registration plate belongs to the vehicle. However, for this to work laser detector cameras will have to be installed on important roads and intersections to capture footage of stolen vehicles. These cameras are not available in India so far and will have to be imported. Technically, until the laser detector cameras are installed or, for that matter, are available in India one crucial safety factor of the new HSRP will be defunct. The cameras can either be installed on fixed positions or used as hand-held devices. The cameras also help in recording details of speeding vehicles.